In response to the recent escalations in France and the Anonymous #OpCharlieHebdo cyber campaign against Islamic extremists platforms, hundreds of French websites have been defaced by Muslim hacktivist groups (mostly from North Africa, such as the Tunisian hacker group dubbed Fallaga). 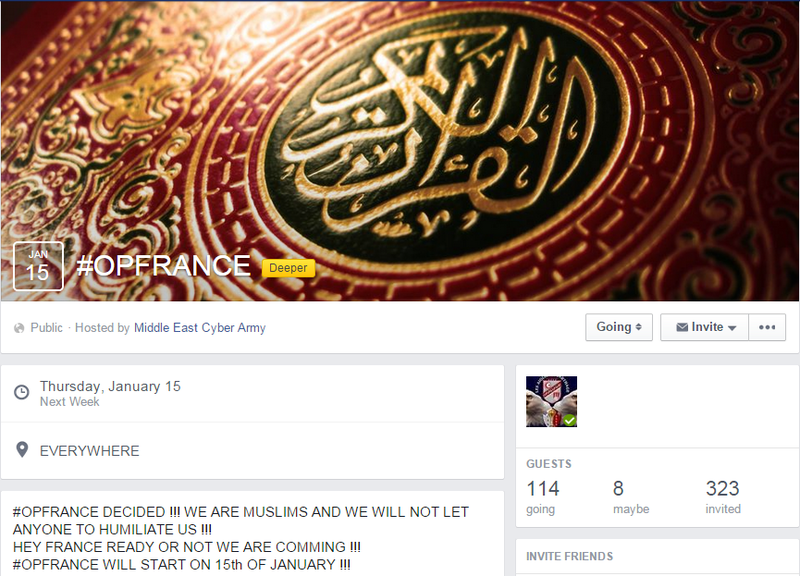 The famous hacktivist group Middle East Cyber Army (MECA) created an #OpFrance Facebook event page for organizing cyber-attacks against French websites on January 15, 2015. Another famous hacktivist group Fallaga created a similar event page that organized an anti-France cyber-attack on January 10, 2015. Finally, motivation to hack French websites is high and the anti-France message is quickly spreading via social media platforms.